One of the benefits of belonging to a running club like the 50 States Half Marathon Club is you get great feedback on races. Let’s face it, there are plenty of races out there to choose from. It is helpful when you can hear what other people thought of the races they have run. I was looking for a race in Alabama that I could do in the winter. 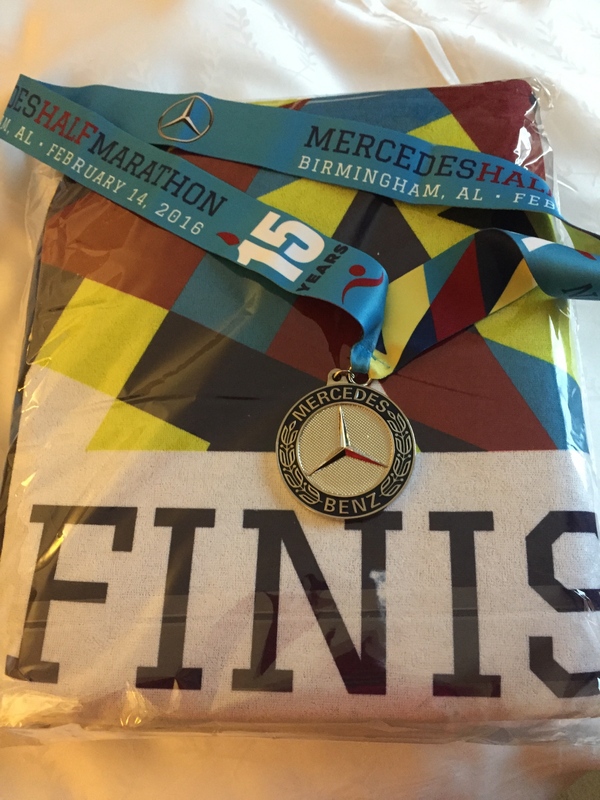 I had heard good things about the Mercedes Benz Marathon and Half Marathon in Birmingham from other club members. This past weekend I headed to Birmingham to run the half marathon. 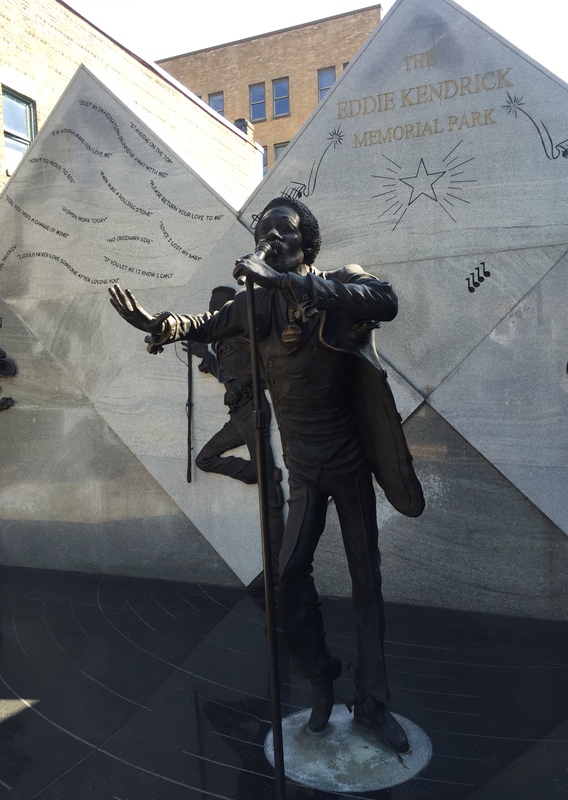 This was my first trip to Birmingham, and Alabama for that matter, so I didn’t know what to expect. Birmingham was once a thriving steel town. I could see the historic Sloss Furnaces (circa 1882) from my hotel room. Like most steel towns in the US, Birmingham has seen better days. There were many beautiful old buildings but not much going on in them. Despite the depressed economy, I found an abundance of Southern hospitality. A merchant along one of the main streets saw me admiring a bench outside his store and invited me in to browse. We talked about his passions for Italy and photography. As I left, he handed me a cup with his store’s logo as a souvenir. I recently found the Roadside America web site that provides information on offbeat tourist attractions. It is a perfect resource for things to see on my funatical runner trips. I checked the web site to see what attractions were listed for Birmingham. 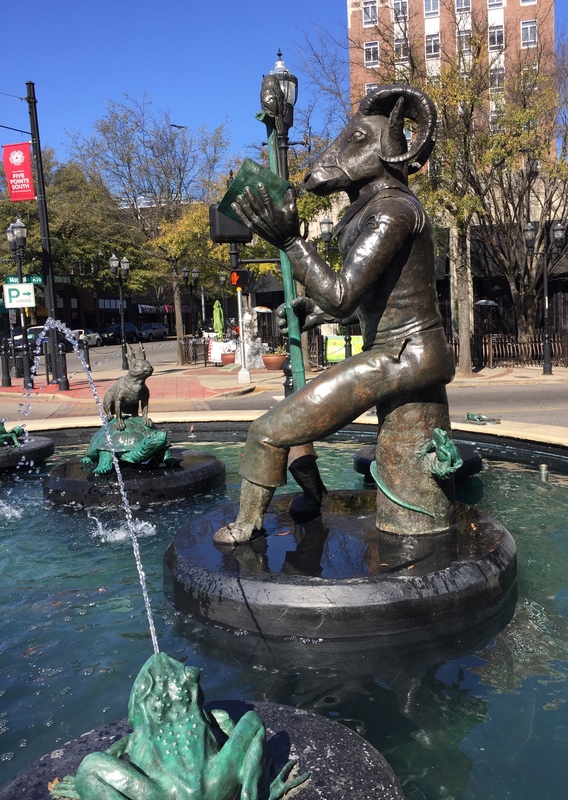 I found a number of interesting places within walking distance to my hotel, including the memorial to Eddie Kendricks from the Motown group the Temptations, and the Ram-headed Storyteller fountain. The day before the race I did my own walking tour of the downtown area before heading back to my hotel room to watch the US Olympic Marathon Trials. Watching Meb Keflezighi (at 40 years old!) make the Olympic team was a great way to get motivated for my race. There wasn’t much in the way of course entertainment but it was unusually cold – 29 degrees at the start – and windy. I can’t blame anyone for not standing out in that weather blowing a saxophone or playing a guitar. In honor of Valentine’s Day there were plenty of red heart-shaped balloons along the course and runners dressed in Valentine’s Day inspired clothes. 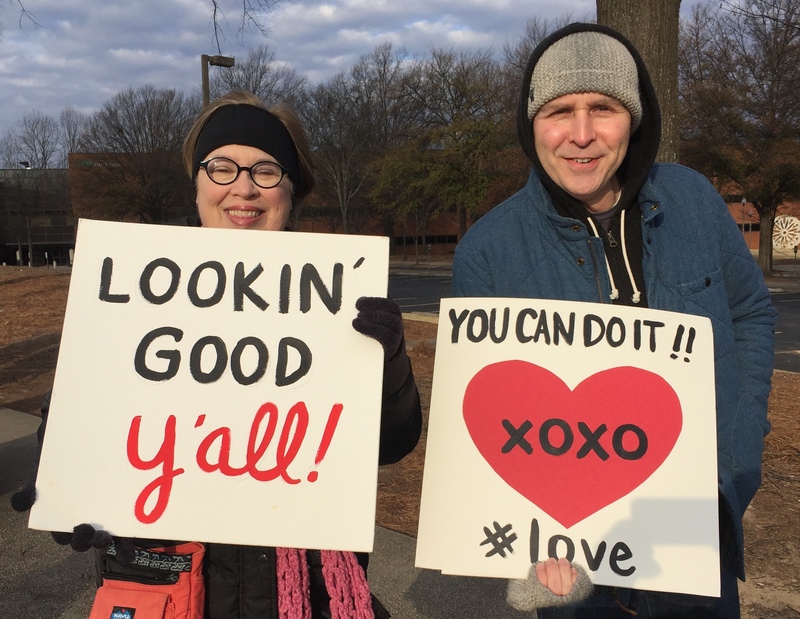 I also saw examples of the Southern hospitality I had been enjoying in the signs spectators were holding. The post-race party was held indoors (out of the cold) and included a free barbecue from a local restaurant. My expectations for what kind of freebies we runners would receive in our goodie bag were high. My last race was sponsored by 3M and runners received a wide variety of 3M products. I thought a race sponsored by a luxury car company should be accompanied by, well, a car or maybe at least a significant discount on a car. The only Mercedes-related products they gave race finishers were a Mercedes hood ornament-shaped medal and a seat cover. 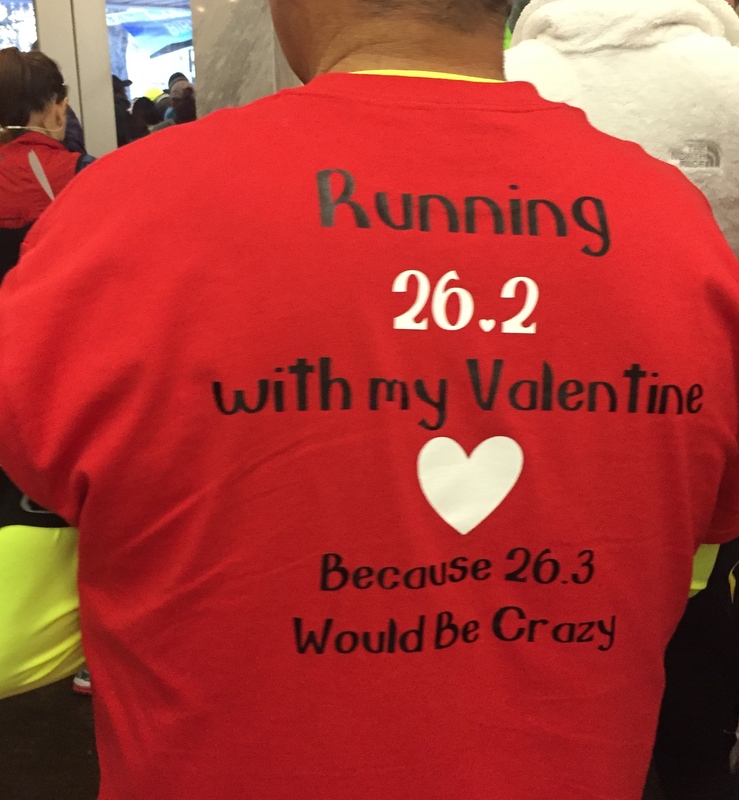 I have to agree with my fellow 50 State Half Marathon club members. The Mercedes Benz Half was a nice little race (only 4,000 runners in the half and 1,200 in the full). I am glad to cross another state off my “to-run” list. The next stop on my quest for 50 States will be New Orleans, Louisiana. ← What’s a Person To Do?